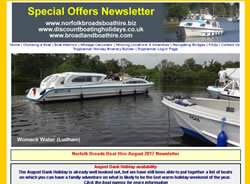 Here you will find our archived Newsletters which are emailed monthly to subscribers containing latest offers and discounts together with general advice for anyone wanting to hire a boat on the Norfolk Broads. To read more, just click an image of one of the newsletters. The cold dark months of winter have just begun and we are already thinking of Easter 2018. And why not! It's good to have something to look forward to when all you have to contemplate are early dark nights and frosts. 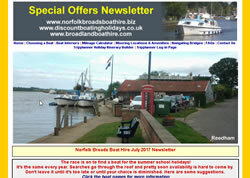 So if you are interested in planning your first break away of the new season, this issue of our newsletter is for you. Currently, many yards are offering a discount to entice you and you can book with a low deposit of just £50 per boat so the Christmas shopping is not compromised. (Sorry for mentioning Christmas). If you have always wanted to visit the Ferry at Surlingham but have not made it yet, our monthly guide will show you what you have been missing. In this month's newsletter the focus is on the end of the current season as well as the start of the 2018 season. 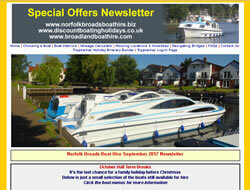 The October half term is throwing up some extraordinary offers with savings of over £400 on some boats. But if next year's break is your focus, a flash sale this weekend can save you an extra £50 plus a 5% discount off selected boats. Great Yarmouth is the holiday resort where the nothern and southern rivers of the Broads meet. The trip to or through Yarmouth can be daunting and a little demanding if the tides are against you. But with a little care, can be undertaken by even first time boaters. 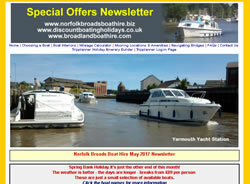 Read more about Yarmouth in our monthly newsletter guide. For more on the above features, click the image for our October 2018 newsletter. It's September and though it's still quite mild, it really feels as though we are heading downhill to the long winter months again. The kids are now back in class and there now remains just one school holiday to get the family together before Christmas. 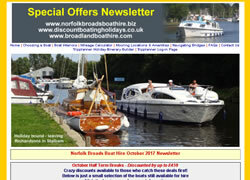 The Autumn Half Term Break is the other end of October and is the Broads last hurrah before the end of the season. Prices are kind to the wallet starting at just £80 per person for a 4 night break. Bramerton, located a few miles by river from Norwich is our featured village. Set on a picturesque bend of the River Yare, Bramerton is a pleasant stop off point with a good choice of moorings. For more on the above features, click the image for our September 2017 newsletter. The last public holiday of the summer - August Bank Holiday - is now only a few weeks away. This weekend is usually a sell out as it allows the whole family to get away while the weather is still warm. But availability is now tight. As such, I have listed boats which are still available to book for 3, 4 and 7 night breaks incorporating the 28th August - the public holiday. 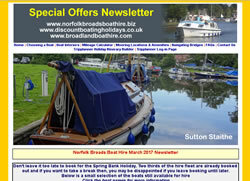 Prices start at £97 per person for a 4 night break aboard Sandpiper, an 8 berth cruiser out of Reedham. 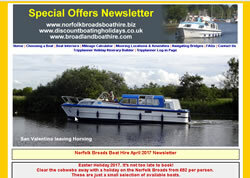 Reedham Ferry is the highlight of this month's town and village feature. It lies around one mile upstream of Reedham village and is the site of Norfolk's last working chain ferry. The Reedham Ferry Inn is riverside and offers extensive moorings. For more on the above features, click the image for our August 2017 newsletter. We are in to July now and the race to find a boat for the school summer holidays is hotting up and many of the larger parties will already be disappointed that the choice is so limited. I have put together a selection of boats which are still available across the first couple of weeks of August - for the time being at least! The Problem: You want to visit Norwich on your holiday but find you do not have time to make it all the way up the River Yare on the southern rivers. You can still fit it in by taking the train which helpfully is available from a few of the villages you will cruise past both on the northern and southern rivers. The idyllic village of Irstead is the subject of our interest this month. This pretty little village can be found on the banks of the River Ant just before entering Barton Broad. A stopover will enlighten you as to why it is so popular. If you see a mooring, grabi t while you can. More on all of the above in the newsletter. The General Election was only a few days away at the time of writing and both the political climate and the weather were starting to heat up. 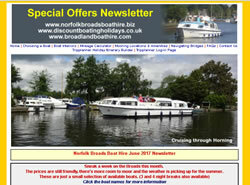 We suggested a break on the Broads in June was the ideal time to take advantage of lower prices, quieter moorings and ther longer days of summer. Bookings always slow when a General Election is near and this month is no exception. As a result there was still good availability for the summer school holidays but that situation was likely to change once the Election was over. Hickling lies the other side of Potter Heigham Bridge and as such you would have needed the services of the Bridge Pilot to get you through. For those intending to make the trip, we featured this picturesque village in our monthly lowdown. Find out about moorings, local attractions and where to eat in our guide. Spring Bank Holiday was just a few weeks away. This marks traditionally the start of the busy season. There was still a good choice of boats available to hire starting from £89 per person. The Ferry Inn at Horning has had to discontinue it's trial of having customers moor their boats stern-on at it's moorings due to the lack of room to manoeuvre in this part of Horning. Boats pointing out into the channel were severely restricting the passage of boats. If you are considering a visit to Beccles on the River Waveney read our lowdown on this Suffolk market town. Everything you need to know from where to shop to where the bars and restaurants are is included. At the time of writing Easter was 2 weeks away and the weather had started to pick up. The spring flowers were out and being as some areas of the country broke up a fortnight before Easter Sunday, families were already out on the water. The hire fleets were now back on the water following their annual services and everything looked spick and span for the new season. The Lion Inn at Thurne, which had closed at the end of October last year was under new management and about to re-open. The Ship in Reedham had also recently undergone a change of ownership. Our featured village was South Walsham. We highlighted mooring facilities, where to go and what to do in this picturesque area. Click the newsletter image for more information. With nearly 3 months still to go to the Spring Bank Holiday, it was remarkable that two thirds of the fleet were already booked. Infact, if you wanted to hire a 10 to 12 berth boat you would have been disappointed. We put it down to the relatively mild winter we were having which turned people's thoughts to Spring holidays. Our village snapshot this month fell on the ever popular Ranworth and it's Broad. There is lots to do at Ranworth including boardwalks, a floating educational centre and scenic views from a 100 foot high church tower. Click the newsletter image for more information. The nights were starting to draw out and the green shoots of Spring could be seen in the garden. 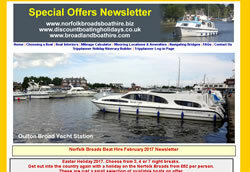 It had been a long dark winter so what better time to start thinking about an Easter Break on the Norfolk Broads. We featured deals from £52 per person for a 3 night break starting Good Friday together with deals for 4 and 7 night breaks. 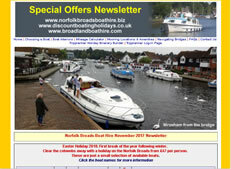 Also in the news was the recent buy out of Royalls of Wroxham, a long respected name in cruiser hire, to Barnes Brinkcraft. Also since last summer New Horizoncraft at Acle had relocated to Stalham and a new name in Brundall NYA Private Cruisers had set up a luxury cruiser hire base.